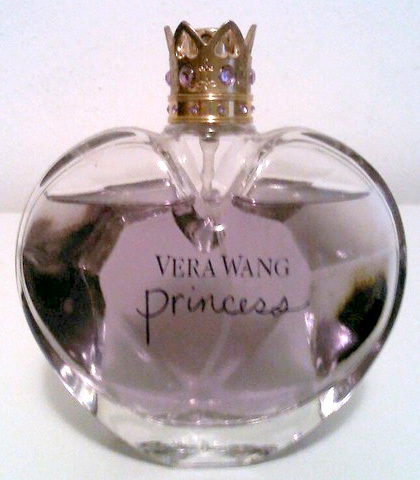 With the huge popularity of Princess, I’ve been finding more and more fakes of it cropping up on eBay. It wasn’t until a bunch of them kept showing up in my eBay “recommended” section that I finally decided to do a fake spotting for it–more out of annoyance than anything else seeing as I thought Princess was a bit of an uninspired mess. But just because I don’t like it, doesn’t mean plenty of other fragrance fans do. 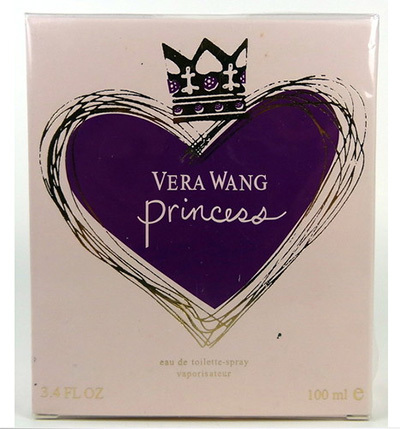 So here’s what to look out for if you’re aiming to buy Vera Wang Princess off of eBay. Please keep in mind I am only focusing on the original Vera Wang Princess. 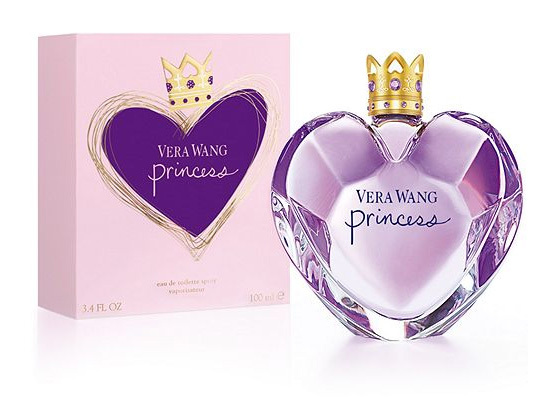 This fragrance has a hoard of flankers, including “Flower Princess” which is largely packaged the same except with a silver cap and the juice appears more pink. So if you see varying styles of Princess, they aren’t necessarily fakes so much as they are official flankers. Here’s a pretty easy one to start us off. First of all, the branding appears to have been put on by marker (more likely just a very poor quality ink) because several of the letters are smudged. Princess is also printed very poorly and the typeface was so smudged and poorly applied that it looks like someone even used a counterfeit typeface. The facets on the bottle are absent and the crown is completely wrong. For one thing, the detailing I mentioned above between the gems? They’re here on this bottle, but they’re very faint and not at all deeply imprinted as they should be. The clean cut upside down hearts on the authentic bottle are also poorly mimicked here with wobbly hearts. Here’s an example of a fake Princess box. Notice how the cellophane isn’t as tight around the box as it should be. Also note how dirty it appears to be on the inside and the printing errors on the box itself. 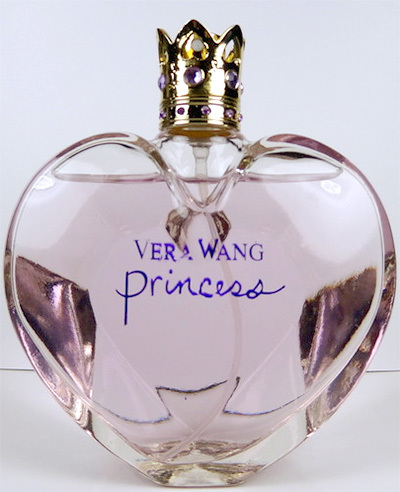 The golden lines around “Vera Wang Princess” are thin and appear rubbed off in some places. The words “eau de toilette spray” are set too close to the graphic and the ink looks dull and discolored. This is either a fake bottle or just VERY poorly photographed. If it is fake, you can tell because the bottle looks squat, as if it was was squished down from its actual height. You can also tell because the text is set way too close to the top of the bottle and appears to be shifted too far to the right. Also the detailing between the gems appears to be off-centered. It is still a really bad photo. In either case, I wouldn’t buy it. While most of the elements appear to be in the right place, something about the condition of this box and the cellophane wrapping bothers me to no end. Notice that the cellophane appears to be lifted off or otherwise poorly applied. The box is also dirty on the inside. Makes me suspicious that this was opened before and may have been tampered with. Whatever the case, it’s a good idea not to purchase a bottle of perfume unless the seller can provide photographs of the actual bottle. This is why I would never buy “New in Box” perfume. I either see the bottle or no deal. This is because it’s harder to fake a bottle than it is to fake a box. And there you have it, fake Vera Wang Princess perfume. It’s all over eBay and other auction sites. Be careful out there. This entry was posted in All, articles, informational and tagged fake spotting. Bookmark the permalink. Even though I wouldn’t be caught dead wearing Princess – a real one or a fake, I’ve enjoyed this post immensely. I hope people who need it will come across it in their search for a discounted Princess.